Newly Opened with A/C Dormitory . We are Khaosan Immjai Hostel (by Khaosan Baan Thai) the outstanding orange building on Samsen Soi 1 located in the middle of an old district of Bangkok. Cheap, clean and cozy with friendly staffs are our determination. We offer the high standards of amenities and commodities for our guests to feel the most enjoyable and happy. You will enjoy a restful night of sleep with high quality mattress, bedding and super air conditioner. With free 4 high speed internet computers and free wifi access throughout the entire house, it is so convenience to contact friends and families or find the information for your plan. The common area is very cozy for relaxing and sharing an experience with the other guests. Also our mini breakfast will let you have a cheerful morning for starting a new day. 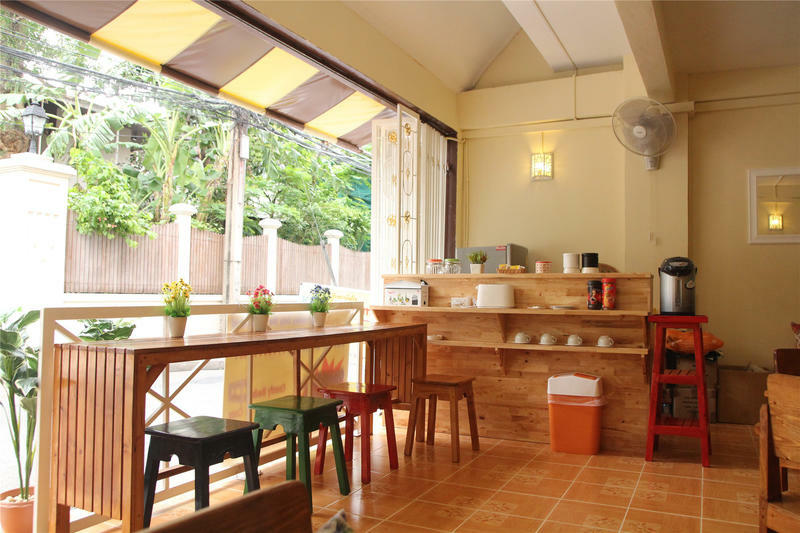 Our location is 5 minute walk to Khaosan road. The bus stop is nearby. We located within walking distance to many tourist attractions. You can easily enjoy your sightseeing to the Grand Palace, the Temple of the Emerald Buddha, Wat Pho, Wat Arun and many more. Only 4 minute walk to Phra Athit pier, it makes Khaosan Immjai is also a perfect point to travel Bangkok by boat along the Chaopraya River. A perfect place to start your exploration in Bangkok and Thailand is here. Do not miss to share smiling with the people from around the world at Khaosan Immjai. 1. By meter taxi : contact to the taxi counter on 1st floor outside of the airport exit, state your destination. There is 50 baht surcharge on the meter (per a taxi). In addition, you have to pay for 2 expressway fee 70 baht. The meter should run up to 300-350 baht and it takes approx. 50-100 mins. depending on the traffic. 1. By meter taxi : contact to the taxi counter, state your destination. There is 50 baht surcharge on the meter (per a taxi). In addition, you have to pay for 2 expressway fee 85+45 baht. The meter should run up to 200-300 baht and it takes approx. 50-100 mins. depending on the traffic. 1) 'Sam Sen Train Station' (nearest to our place), you take bus no. 9 (8 Baht for fan and about 20 Baht for a/c) around 40-50 min. to 'Sam Sen Soi 1' (in Thai : สามเสนซอย 1). 2) 'Hua Lam Phong Train Station' (the main one and the last stop), bus no. 53 (this is a circle line so please ask the staff on the bus where you want to go) about 8 Baht and approximately 50-70 min depends on traffic. to 'Sam Sen Soi 1' (in Thai : สามเสนซอย 1). when you get off the bus, then walk across the main road to Sam Sen Soi 1 and then walk through it around 20 meter, you will see only one shiny orange building on your left hand side. For taxi (meter only) or tuk-tuk from train station to here about 70 - 120 Baht, 30 - 50 min. depends on the traffic also.